Each time I have to attend a competition, the famous ABBA song “The winner takes it all” has to play in my head on the loop. 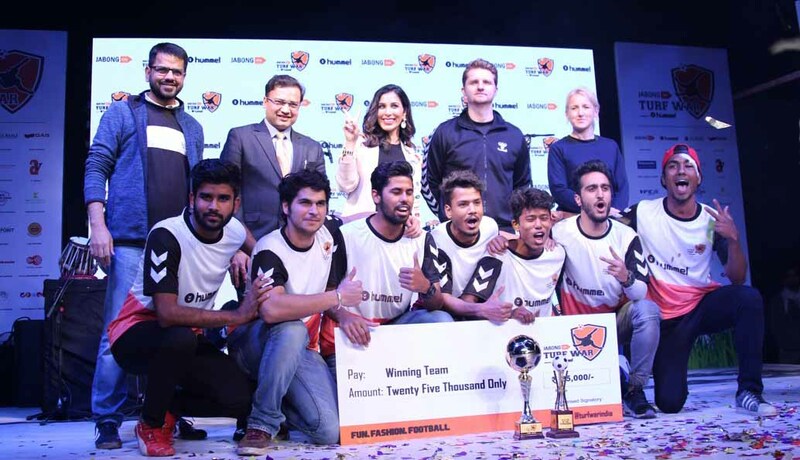 Although at the recent Jabong Turf War Season II powered by Hummel, it was the spirit of sportsmanship that emerged shining among young college players. After a series of inter-college football matches were played among 16 colleges, it was the Sharda University that lifted the champions trophy and won a cash prize of INR 25,000 at the final match. The winners won by 10 goals from Greater Noida Institute of Technology in the final match held at GL Bajaj Institute of Technology and Management. The event was hosted by MTV VJ Clince Varghese also featured a fashion show sponsored by global premium apparel and denim brand GAS. Adding to the glitz at the college runway show was former MTV VJ and singer Sophie Choudry and reality TV Shows stars like Martina Thariyan, Shreeradhe Khanduja and Benafsha. Here are a few snippets from the sporty event, we are sure the zest and zeal of these youngsters will take you back to your college days.